Obesity and related health problems are a leading preventable cause of death in America. But for many people, gym membership fees are a barrier to getting in shape. 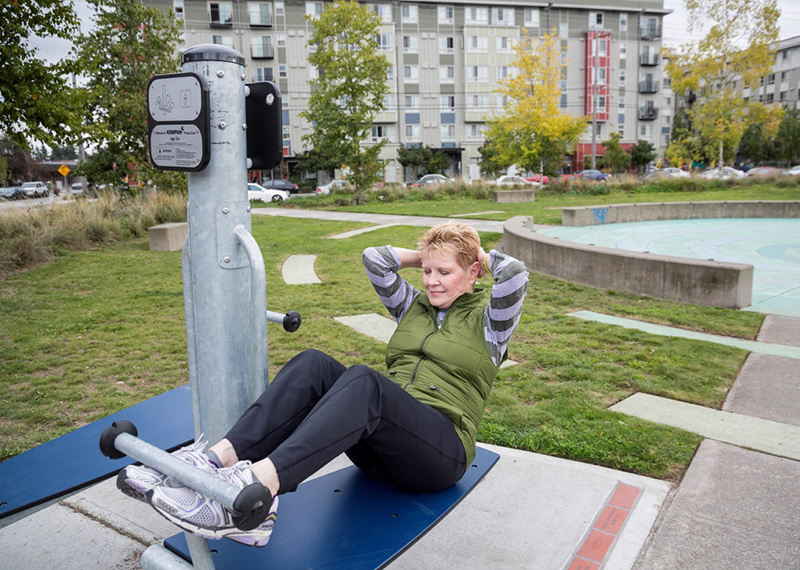 The Trust for Public Land is working with our partners, Seattle Parks Foundation, Seattle Parks and Rec, and MOMentum!, to bring free outdoor exercise gyms to parks across the city. We installed our first Fitness Zone® area at Bitter Lake in 2013, and since then have been expanding the program to other neighborhoods around Seattle. In April, 2016 we joined residents of the Central District in celebrating the opening of a Fitness Zone at Powell Barnett Park. And this summer three more Fitness Zones will be installed at the Delridge Community Center in West Seattle, Hiawatha Community Center in the Admiral District, and Van Asselt Community Center in South Seattle. Once completed, more than 19,000 people will live within a 10-minute walk of a fun, accessible, and free outdoor gym. Help Seattle get in the Zone! Donate today.